We’re down to the dregs in our kitchen this week. I’m trying REALLY hard to come up with meals out of the things we have left. We’re down to several pounds of ground beef, chunks of ham, a ridiculous quantity of canned tuna, and some Italian sausage in the freezer. As we’re out of at least one ingredient for almost everything I make regularly with ground beef, that was out. Sausage it was. So for my own recipe for Thoughtless Thursday, I threw together this soup (also doubling as my entry for Kahakai Kitchen’s Souper Sundays). I have to say, I thought it would be decent, but I was really amazed at how rich and flavorful it turned out. I’m normally not that huge a fan of Italian sausage, but it adds so much wonderful flavor to the potatoes. I will definitely be making it again, perhaps with some homemade focaccia as a side. This would also go well with a salad. I think for my next attempt I’ll use either red potatoes or Yukon Gold potatoes–something thin skinned. But the russet taters worked just fine. Excuse me, I need seconds. Cut a slit in your sausage links and peel off the casing. Break up the sausage and cook over medium high heat. Meanwhile, scrub and dice your potatoes, and add to the crock pot. Check and stir your sausage. Dice your carrot, celery, and onion. Set aside. Add your chicken stock to the crock. You can use homemade or store-bought. I had a mixture of the two. Add the garlic to the crock. Your sausage should be done by now, so spoon it out into a colander and rinse thoroughly with very hot water. Return the skillet with the sausage grease to the stovetop and add your carrot, onion, and celery mixture. Saute this on medium for approximately 5 minutes or until onion becomes translucent. Add the sauteed vegetables to the crock and stir well. Add the thyme, rosemary, salt, and pepper. Cook on high for 4 hours or low for 8 (until the potatoes are tender). This worked out to 5 servings at 406 calories and 16 grams of fat per serving. Rachelle from Pantry Eats offered up this amazing looking Honey Whole Grain Bread. BREAD! From the crock pot! Who knew you could do such a thing? Maybe I don’t need that bread machine I’ve been lusting over for the last six years… I’m having some kind of weird picture difficulties this morning and can’t get it any bigger. You really need to go to her site to look at it. It’s awesome. Please join us next week for the Thoughtless Thursday Roundup! Your soup looks hearty and delish! It was hearty but not too heavy, which was nice since it’s definitely NOT soup weather just now! Hearty, hearty eats. This is a nice soup. The sausage and potato combo is great. 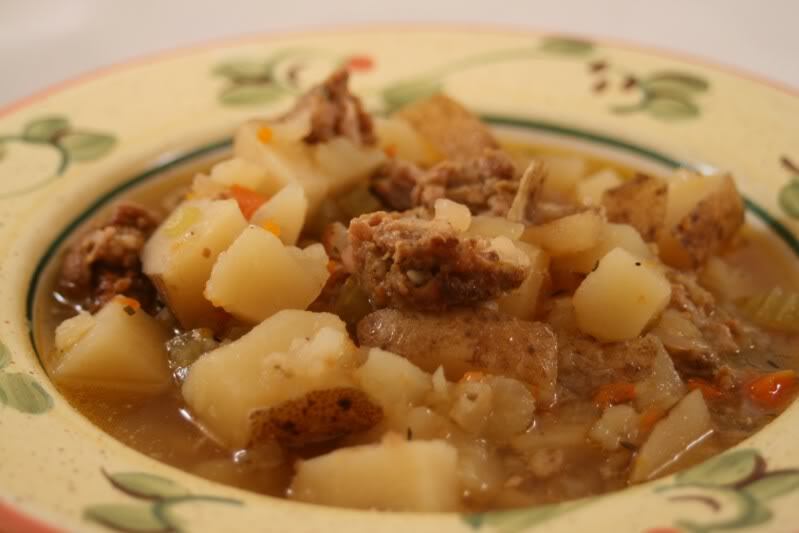 Sausage and potato is such a great combo and your soup looks delicious! Thanks for sending it to Souper Sundays–the round-up is now posted. Have a great Sunday.